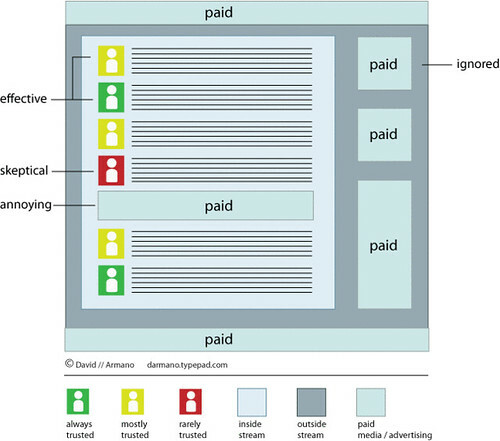 Several months ago I did some thinking around the notion of "paid and earned media". I wanted to continue that vein of thinking a bit, perhaps broaden it and provide some new context. Let's put marketing aside for a moment. Let's even put the social web aside. Before our obsession with "social media" existed, we had e-mail, which as imperfect as it is has become very relevant when we think about things such as attention, action and even influence. Not unlike Digg, Twitter, Salesforce, or even RSS feeds to name a few—e-mail acted as our original streams. We receive messages, communications, responses etc. from friends, co-workers, relatives, brands, companies—you name it. We've all developed systems to filter the signal from the noise and prioritize our interactions using e-mail software or even cloud based services such as G-mail. But here's the secret to e-mail that everyone knows. Half the battle is getting "in the stream" meaning that marketers will do most anything to get in there. Some force their way in. This of course is called "SPAM". The other half of the secret is earning the trust of the individual who controls their e-mail ecosystem. This of course can be just as difficult if not more so than merely getting "in the stream". Let's say you are a brand that someone trusts. You may be rewarded by getting permission to be "in the stream". Violate that trust and you are just as easily removed. Or in some cases demoted—you've gone from being "always trusted" to "rarely trusted". And who enjoys premiere status in this ecosystem? Those you do trust—or have high frequency interactions with. Friends, co-workers, family, etc. This isn't a secret—surveys from sources such as Forrester back this up, not like we need that validation, it's common sense. Now let's fast forward beyond e-mail (without excluding it). Many of us have supplemented our digital diet of websites and e-mail with a healthy dosage of search activity, social networks of all shapes and sizes and Web services that allow us to produce and share content and connect with peers, communities and other businesses. What many of these have in common is that they exhibit "stream" like functionality. Facebook for example has pushed their experience even further in this direction to mimic the stream dependent interface on Twitter. Mobile versions of both platforms enhance this even further. Search results on Google are dependent on a pagination model, but the stream metaphor is applicable here as well. Advertising happens mostly "outside the stream"—but there are battles waged to get "in the stream". This of course is called "search engine optimization". Of course it's also common knowledge that the best search optimization is great content. Great content typically leads to what's called favorable "organic search results" meaning the more popular the content, the higher it surfaces in the stream. There are all kinds of ways people are trying to gain access to your "streams". In feed readers, ads can be placed directly inside the stream in between posts. In more direct models like Pandora, ads show up directly in the stream (the service is arguably valuable enough to make this tolerable). Bloggers can write about your products and services and marketing is inserted directly inside the stream often times indistinguishable from the advertising that may surround it. There are services which will automatically generate a "tweet" if you've performed some type of interaction with a brand. All of this can get content, messages and information about products, brands, services or even individuals inserted. In some cases, even in context. This is something that you can be sure many people are trying to figure out. While "getting in the stream" may be doable from both technical if not clever means (PR firms know how to do this), trust is another story. Trust equals attention. It's that simple. And right now, everything comes down to attention. We're all overloaded by demands for our time and most of us can't invest in filtering activities 24-7, so we default to giving our attention to those we trust. And this is where it comes full circle back to the e-mail example. Trust has to be earned, and once earned it leads to attention. Trust can be broken and there are multiple levels of trust. If you think of social business (a term I'll use for doing business in an age where the social web is becoming ubiquitous), think of a spectrum where on one end is a large enterprise and on another is the individual. There's a great deal of nuance in between (not to mention overlap). On the consumer side of things, as we manage our streams both from a professional and personal perspective, we prioritize our attention based on who we trust the most (individual or brand). On the enterprise side, it's not all that different, though the ecosystem may be. Let's say an organization is levering an assortment of Wikis, internal blogs, communities and forums. Who do you think will get the attention and influence adoption of new systems etc? Those who have earned trust within the organization. While anyone within a large corporation can gain access to a stream (just as in non-enterprise), those who earn trust will earn attention. They will influence. The bottom line in both enterprise and consumer scenarios is the trust + getting into the stream can be a very effective way to get someone's attention. Other methods will likely be met with skepticism, get ignored or be flat out annoying. Anyway, just a few thoughts I've got rolling around in the noggin at the moment. What do you think?